As far as I know: when we make an ssl connection to a site we receive the site certificate, the browser check if the site certificate is in its list of root and trusted certification. So if the CA is NOT in the browser trusted roots the connection should fail! Why does IE trust this CA? You ran all of us into a wild chase. Your screenshot shows Class 2 Primary CA in your Trusted Roots. This is the root CA for the site you linked. KEYNECTIS is not the root of the site you linked, but is a CA signed by Class 2 Primary CA in your trusted root. Nothing is wrong. Everything is working as intended. CLASS 2 KEYNECTIS CA is signed by CertPlus Class 2 Primay CA. CertPlus Class 2 Primay CA is in the root certificate store on Windows and FireFox. How issuer's certificate is found to verify a given certificate? 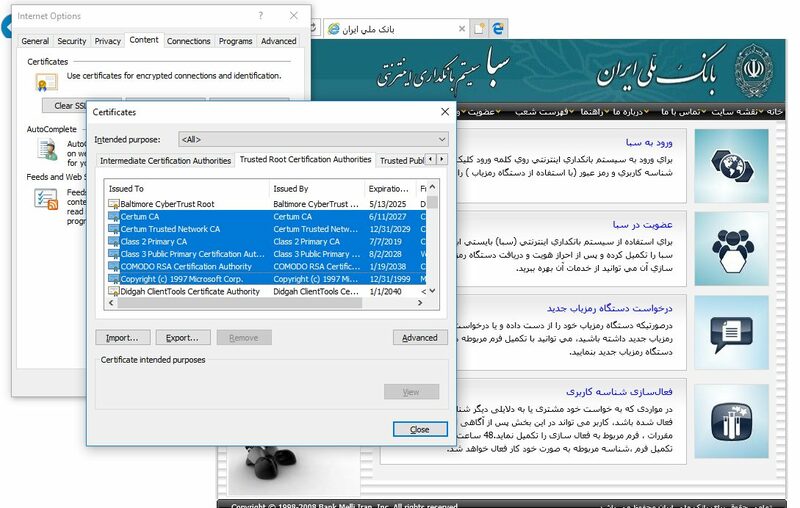 How does the browser/app trust the Root CA when the installed Root CA certificate expired?